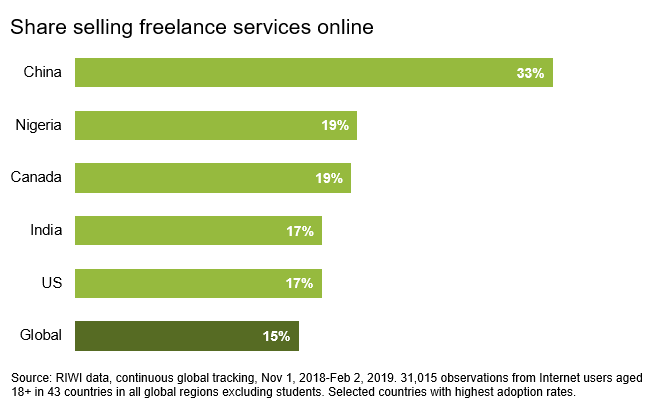 New online platforms now make it possible for anyone to sell freelance services — such as graphic design, data entry, or software development — into global labor markets from anywhere. Common wisdom has it that this type of work is insignificant. But there is no reliable, current, globally comparable signal that anticipates when it will become mainstream. 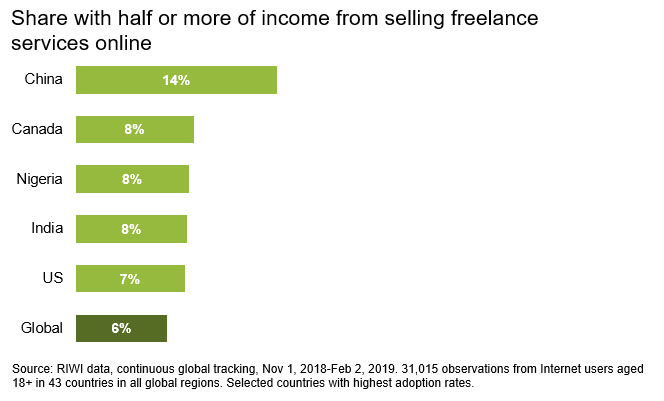 To address this, RIWI asked 30,000+ randomly engaged Internet users in 43 countries whether and if so, how much, of their income comes from selling freelance services online. The resulting signal shows that China is by far the leading adopter of online freelance work. It also shows that, as we would expect, online freelance services are not yet a key income source for most of the global population. But a material share of Internet users in Canada, the US, India, and Nigeria all report that freelance work is an important income source. It will be critical to watch these early adoptee countries to see if this trend accelerates, and to understand the factors that contribute to it. This is part of RIWI’s leading indicator to anticipate the future of online-enabled ‘gig’ work globally. The signal’s quality is enhanced by engaging a broad range of voices, including those not typically included in workforce data (such as young people). For more on RIWI’s work on the future of online-enabled ‘gig’ work, see here.